Bullfrogs are in decline, along with other amphibians, but bullfrogs are also part of the problem. That's where frog-gigging comes in, filling a predatory void. As a final installment of our three-part series on frog gigging, we have to end the series with some bad news. West Tennessee is reporting declines in its bullfrog population and, after digging deeper into the status of bullfrogs, it appears this trend is not limited to Tennessee. Unfortunately, according to the U.S. Department of Interior, there is no single answer to why amphibians — which includes frogs, toads, salamanders and newts — are in decline. The average decline in overall amphibian populations is 3.79 percent per year, though the decline rate is more severe in some regions of the U.S., such as the West Coast and the Rocky Mountains. Tennessee state biologist Rob Colvin says “the number of bullfrogs has declined, and hunting them has become more difficult.” And while the decline has been steady for decades, population numbers haven’t dipped low enough to warrant frogs and other amphibians to be added to the threatened species watch list. Chytrid fungus, cited as a primary cause of decline in the Upper Midwest and the New England states, is a newly discovered fungus. It’s typically found underwater on dead plant and animal matter. Affecting the skin of amphibians, it causes a disease known as amphibian chytridiomycosis. And, if you remember your science lessons from school, you might recall that amphibians’ skin is unique. Frogs, toads and the like rely on their skin to breath and take up water. The disease caused by Chytrid fungus interferes with this process. If a frog becomes infected with chytridiomycosis, it will likely grow lethargic and often unable to right themselves once turned upside down. It’s not uncommon for the infected frogs to jump and swim in circles. If Frog Populations Are Threatened, Should You Be Frog Gigging and Eating Frog Legs? Bullfrogs are native to the eastern United States, but they have been introduced in all 48 states. They probably made their way outside of their native region accidentally as many lakes in the western U.S. were being stocked with fish. Plus, they were intentionally introduced as a food item during the early 1900s. But paradoxically, bullfrogs have been blamed for the decline of other frogs. So while the bullfrog is threatened itself, it is also a threat to the very amphibians suffering from consistent, year-to-year decline. That’s where you, dear frog-gigging friend, can fill a void. Where you go, the bullfrog predator goes also. The writer is pictured here on a frog-gigging Saturday night. Fond of frog legs, she considers frog gigging to be a legit act in conservation as it gives other frog species a fighting chance at survival. What’s unique about bullfrogs compared to other frogs? The bullfrog is the largest species of frog in the United States with males reaching 8 inches in length and weighing up to one pound. They inhabit a variety of freshwater habitats including ponds, marshes, streams and rivers; as well as man‐made habitats such as canals and storm water ponds. Bonus: Unlike other frogs, bullfrogs spend most of their time in the water where they feed. What does a bullfrog’s call sound like? The bullfrog is named after its distinct call which sounds like a cow mooing. What regions of the U.S. are populated by bullfrogs? 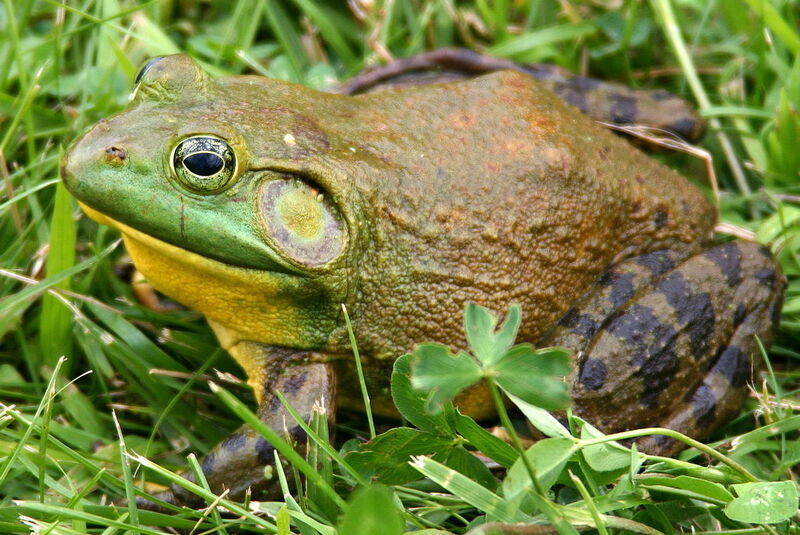 The bullfrog is native to the eastern United States and southern Quebec and Ontario. It has been introduced to many areas of the western United States, Europe, South America and Asia. The bullfrog can now be found in all of the lower 48 states. How far can a bullfrog travel in water? Bullfrogs can travel up to a mile over land during wet seasons, allowing them to colonize new waters and expand their range. This post is part 3 of a three-part series on frog gigging. Part 1 covers frog-gigging basics, while part 2 offers tips and benefits to frog gigging by kayak or paddle board.